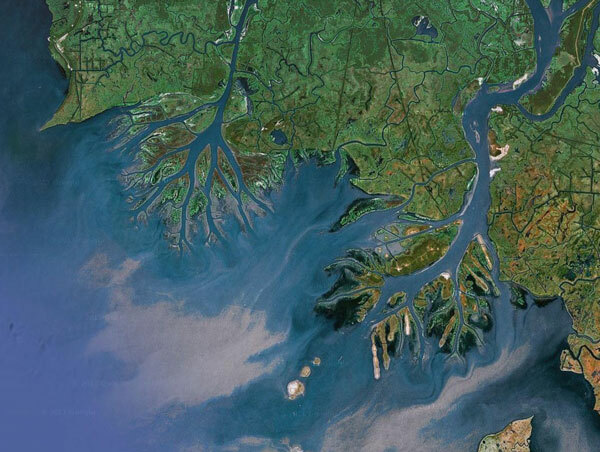 A delta, as defined by the USGS (U.S. Geological Survey), is the fan-shaped area at the mouth, or lower end, of a river, formed by eroded material that has been carried downstream and dropped in quantities that can not be carried off by tides or currents. Boggs defines a delta as any deposit, subaerial or subaqueous, formed by fluvial sediments that build into a standing body of water. The term "delta" was first applied about 450 BC by the Greek historian Herodotus, who noted the similarity of the Greek letter to the shape of the accumulationccumulation of sediment around the mouth of the Nile River. Despite the fact that many of the world's deltas do not show this particular morphology, the term has remained (Carter and Woodroffe). English borrowed this sense from Greek, although the word delta appeared first in English as the name of the letter, in a work written possibly around 1200. The sense "alluvial deposit" is not recorded until 1555, when delta is used with reference to the Nile River delta. Deltas can occur in lakes and inland seas as well as in the ocean, but they are most important in the open ocean (Boggs). Deltas are particularly common in the modern ocean owing to post-Pleistocene sea-level rise coupled with high sediment loads carried by many rivers. They often contain extensive wetlands, whose high biological productivity makes them vital nursery grounds for fisheries. Huge amounts of coal, oil, and natural gas are found in subsurface ancient deltaic deposits. 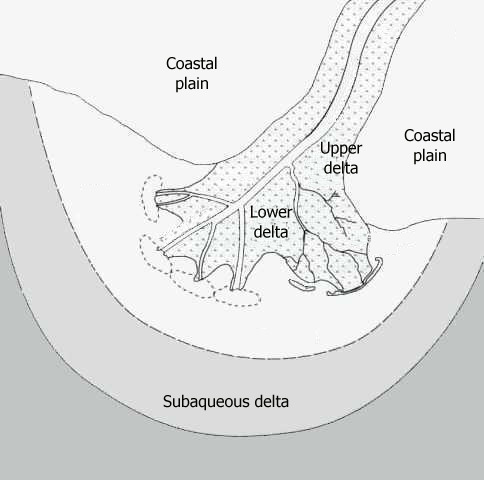 Deltas seldom form on active, subducting continental margins because there is no stable shallow shelf on which sediments can accumulate. Twenty-five (25) of the world's largest deltas are found on passive margins of continents. They are categorized according to features within the delta plain and by energies acting on the delta (tide, wave, and fluvial). The size of a delta is dependent on the size of the drainage Basinasin, the elevation of the land, and climate. What does a typical delta look like? Click on the region of map you would to visit. What are the different types of deltas?